The night vision goggles CVS-7 BC with manual gain control is an effective head mounted night vision system that enables surveillance in both moonlight and starlight. The manual gain control knob allows the user to adjust image brightness to match the surrounding environment or other user-specific requirements. The CVS-7 BC is equipped with a built-in infrared light-emitting source (IR illuminator), that makes it possible to use the equipment when there is little to no ambient light. The goggles utilize II+ or III Gen. image intensifier tubes. Automatic bright light cut-off to protect the image intensifier tube. Both automatic and manual gain control for the best possible image contrast under very high and very low light conditions. LED lights visible in the eyepiece viewing area that indicate operation of the bright light cut-off system and IR illuminator, as well as to alert the user of a low battery. Powered by single CR123A or AA battery. Filled with dry nitrogen to prevent internal fogging. Headmount Assembly - adjustable universal assembly that secures the CVS-7 BC to the operator’s head providing hands-free operation. Demist Shields - attached to the goggles eyepieces and coated with an anti-fogging compound, prevent condensation from developing on the optics when using the equipment in the rain, in wet or cold weather. Sacrificial Window - attached to the goggles objective lens, protects the optics in environments with large amounts of dust, dirt or debris in the air, as can be found in environments with high-speed winds or storm conditions. It also prevents condensation from developing on the optics when using the monocular in the rain, in wet or cold weather. 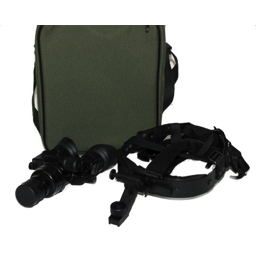 3X Afocal Lens - converts the CVS-7 BC into a middle-range night vision binocular. Ideal for middle range observation.